Documentation Record Data on Each-and-Every Security System Event! Communication Features Send Secure Dual-Path Alarm Signals to the Central Station! 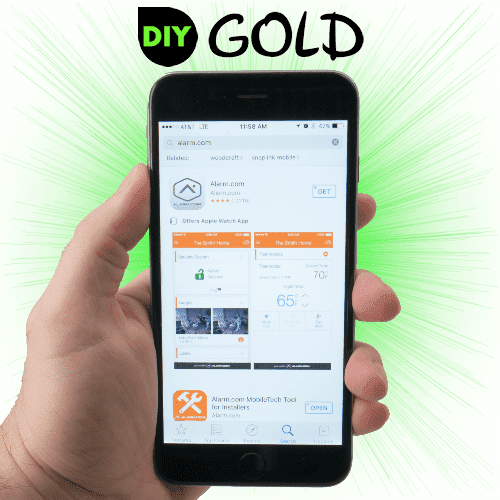 Alarm Control Easy Apps for Android, BlackBerry, iPad and iPhone! Notifications Receive Text/Email Notifications of Events When They Happen! Home Automation Remotely Control Your Home Automation from Anywhere! Surveillance View Your Alarm.com Security Cameras at Anytime! 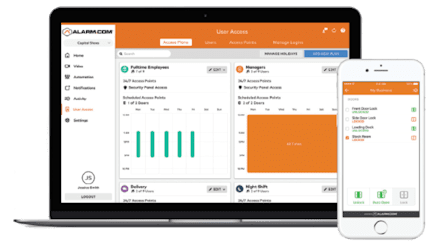 What is Alarm.com Interactive Business Monitoring? Alarm.com is one of GeoArm's premier interactive business alarm monitoring partners. 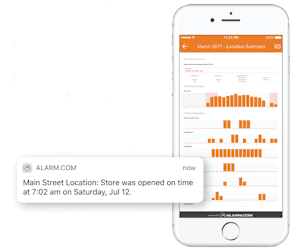 Feature-rich, the Alarm.com app allows users to make changes to their business security system such as arming and disarming from their phone or computer, viewing their business through a camera, or seeing the status of sensors. 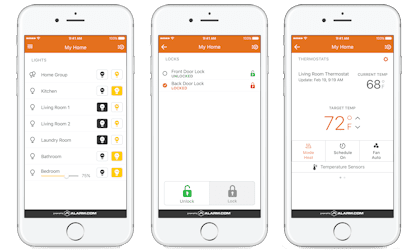 Much like Honeywell's Total Connect, for those who are familiar, the Alarm.com app can give peace of mind to any user who is not at the business, but wants to know that everything at the business is okay. 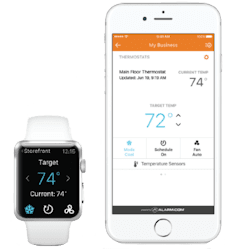 Whether it's complex energy management, or smart business automation options, Alarm.com will bring your 2GIG, GE Interlogix, or Qolsys security system into the modern age. Take control of your Alarm.com compatible smart automation devices. Interact with your smart Alarm.com business security system and turn on/off your lights and set smart schedules to automate the occurrence. Lock and unlock your front door, or any door you choose. 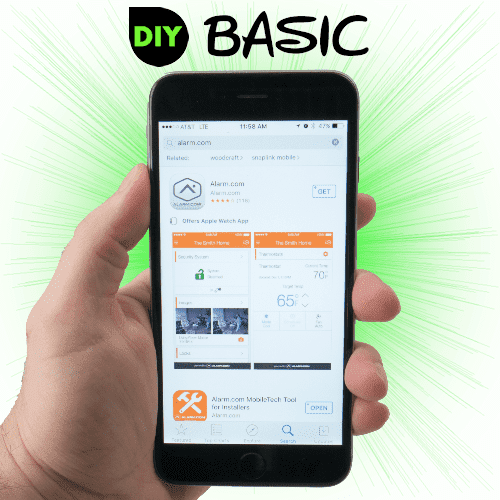 Easily control your thermostat for all times of the year and more! Alarm.com helps your customers reduce energy waste and enhance liability control. Owner's can remotely control temperature settings and will know instantly if someone has adjusted the thermostat. Lighting schedules keep businesses safe and well lit, reducing liability and risk. The robust Alarm.com platform provides the critical information needed to help run your business more efficiently. Business insights deliver actionable data to help your customers make smarter decisions around staffing, energy use and more - all across several locations. Know the busiest hours of business. Maximize staffing efficiency. See whether the business is regularly opening on time. Receive notifications if employees are arriving late or leaving early. 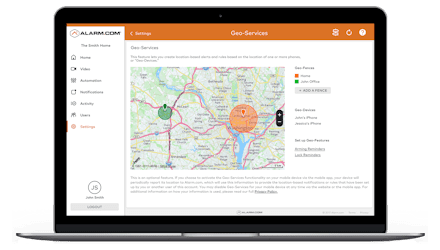 This feature lets you create location-based alerts and rules based on the location of one or more phones, or "Geo-Devices". When activated, your phone will periodically report its location to Alarm.com, which will use the rules that have been set up you on the account. Automate location-based rules such as; turn my smart thermostat "On" when my phone is detected within 10 miles of my business. This fully integrated solution allows owner's to control, track and manage access to their properties. 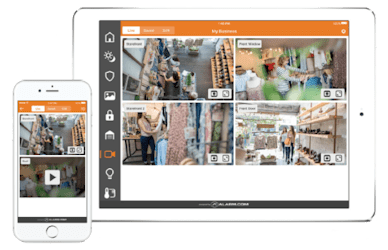 With powerful user management software, remote door control, and scan-to-add card serial detection, owner's can easily manage a wide range of access control and intrusion setups. With a range of commercial-grade Alarm.com security cameras, you can flexibly address the monitoring needs of business properties. Owners can view live streaming video from anywhere and receive instant video alerts on important activity. On-site and cloud-recording ensure your video feeds are secure and tamper-proof.